Stockholm’s Acne Studios specialise in producing classic pieces and wardrobe staples in keeping with a distinctly Scandinavian aesthetic. Crafted from pale pink linen, this Taline T-shirt features a round neck and long sleeves. 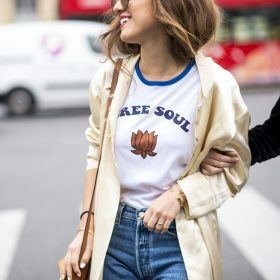 You already know that women's t-shirts make up the basis of your wardrobe so it makes sense that you can never have too many! Sometimes it's a good idea to mix things up which is why the collection of women's long sleeve t-shirts is a great place to start exploring. In this category we have long sleeve t-shirts for pretty much any occasion; looking for patterned long sleeve t-shirts? How about looking for your favorite label? Maybe a cropped tee to wear with a new denim skirt? You can easily search for your new t-shirt by brand, shop, material and color by using our filters.